Marc Chagall was a Russian artist of a devout Jewish family, born in Vitebsk. Marc Chagall went to St Petersburg in 1907 where he entered a minor art school, at the same time working as a sign painter; throughout his work a foundation of Russian art and the sign painter's technique was evident. Marc Chagall went (1910) to Paris where he came in contact with the Cubists; his work began to show Cubist influence (e.g. Homage to Apollinaire, 1911-12) but subjects generally remain of life in Vitebsk. In 1914 Marc Chagall returned home and contributed to Larionov's exhibitions and the Knave of Diamonds group. Marc Chagall was drawn back to his Jewish heritage, expressed now with a deep sense of pathos, as in The Praying Jew (1914). His marriage resulted in a series of exuberant paintings of lovers, e.g. Birthday (1915-23). After the Revolution, in 1918, Marc Chagall was appointed director of the Vitebsk art school, which became a centre of avant-garde ideas, but was soon ousted by Malevich and left for Moscow. From 1919 to 1922 he worked as theatrical designer for the Jewish State Theatre, executing murals there. In 1922 he went to Berlin, executing Mein Ieben etchings for Vollard who then invited him to Paris (ills for Gogol's Dead Souls). In 1925-6 he completed a set of ills for an ed. of La Fontaine's Fables and held a 1-man show in N.Y. In 1930 his autobiography, Ma Vie, was publ., and Marc Chagall began to prepare ills for the Bible, travelling to the Middle East. He went to the U.S.A. in 1941, producing the decor for Massine's ballet Aleko (1942) and Bohn's Firebird (1945) both for the Ballet Theater. 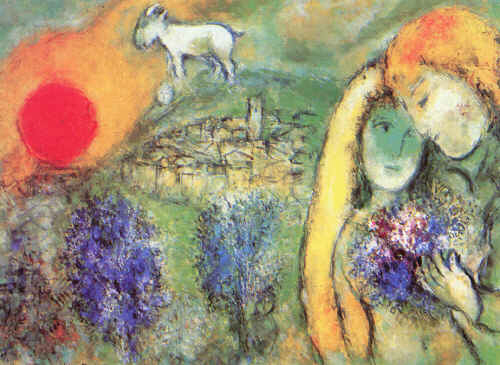 Marc Chagall returned to France after the war. Of later work, his designs for stained-glass windows should be mentioned, and his paintings for the ceilings of the Paris Opéra.